USGBC Blog: Can the Private Sector Play a Bigger Part at COP17? Can the Private Sector Play a Bigger Part at COP17? 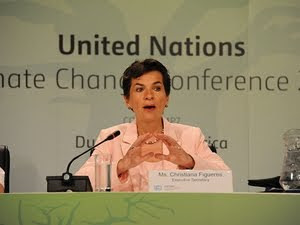 UNFCCC Executive Secretary Christiana Figueres summed up this weekend the hope and frustration that the climate change negotiations -- also known as COP 17 -- uniquely embody. Speaking this weekend to jet-lagged executives from clean energy companies, she recounted hearing an agitated delegate barking into his cell phone: "I can't talk now. I'm at COP 71!" Well, for many it feels like it may take 54 more years to reach consensus in these delicate, divisive and complex negotiations to hash out what Figueres referred to as a "business plan for the planet." But, of course, time remains decidedly unfriendly to such a schedule and everyone in the room knew how very dark the humor was in Figueres' anecdote. Here with a delegation of green building advocates from South Africa, Jordan, France, Japan, Australia and New Zealand, I'm on the lookout for glimmers of hope. I found them later in the day when Figueres told another group of business leaders a surprising fact. She explained that the negotiating text now included, for the first time ever, what she referred to in hushed tones as the "P-word." She was talking "P" for "private sector." To those of us advancing market transformation through creative non-regulatory strategies (such as green building certification), it was music to our ears. Apparently someone realized that while the U.N. is an association of national governments, creativity did not lie primarily, or perhaps even substantially, in the government sector. The business community would be needed for more than just docile implementation. Yes, there needs to be a comprehensive legally binding treaty. Yes, there needs to be mandates that ensure that industry no longer externalizes 90 percent of the true costs of doing business, including the very dangerous -- and at a minimum, profoundly risky -- climate impacts. But that is not going to happen until industry better recognizes their stake in the ultimate business infrastructure: our one and only planet. Negotiations move into their more definitive stage this week, and already on Monday there were thicker security lines, more crowded cafes and more buzz in the hallways. It is only expected to heat up as more ministers arrive for the "high-level" sessions that take place the second week of every COP. Much remains less than transparent about where things actually stand. But it is clear the objective of the "business plan for the planet" is enterprise survival. Image CC licensed by Flickr user UNclimatechange.